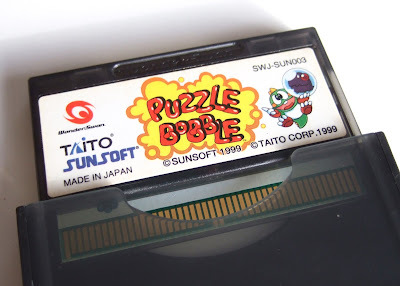 I've got to be honest here: I was more than a bit apprehensive about buying a black-and-white port of Taito's Puzzle Bobble. The fact is, I'm generally not all that interested in black-and-white ports of games that usually are drenched in color. You know, like, the platformer--Bubble Bobble--that spawned this puzzler. Or Puyo Puyo. Hell, even Pac-Man, Bomberman and Adventures of Lolo come to mind. Still, I've had some good times with the pair of Bubble Bobble titles that were published for the GameBoy in 1990 and 1993. 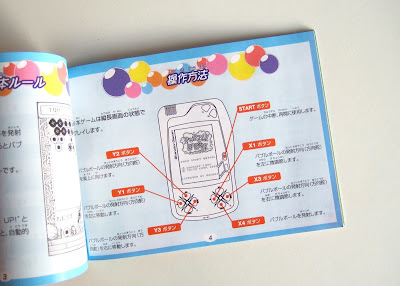 Also, I'm surprisingly fond of Rainbow Islands: Putty's Party, as I explained in my most recent "Welcome to WonderSwan World" write-up. 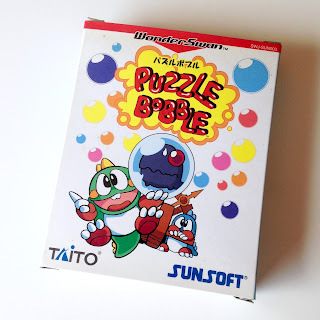 So, when I came across a rather cheap complete-in-box copy of Puzzle Bobble for WonderSwan a couple of months ago, I bit the bullet and bought it despite my initial reservations. Am I happy I with my purchase now that I've spent some time with this seemingly gimped conversion of Taito's classic coin-op? Yes, I am. I don't want to say too much about why that is in this post, though, because I'll cover a lot of that ground in a future installment of "Welcome to WonderSwan World." What I'm willing to say here: Puzzle Bobble's WonderSwan port both looks and sounds better than you're probably imagining (you can see and hear what I'm talking about in this YouTube longplay of the game). Also, it's surprisingly enjoyable to play. This iteration's graphics and gameplay aren't solely responsible for why I'm glad I added this title to my growing collection of WonderSwan carts, however. Just as responsible: its packaging, of course. The best part of owning a complete-in-box copy of Puzzle Bobble for WonderSwan, in my humble opinion, is its cover art. Although not as amazing as the illustration conjured up for the game's Neo Geo Pocket Color port (see it here), it's basically on par with the one plastered across the front of the Puzzle Bobble Super Famicom box. 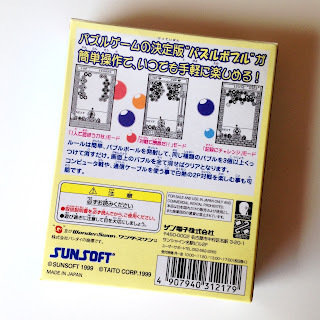 Going back to Puzzle Bobble's WonderSwan cover imagery, while looking at this post's first photo, you may notice it sports both a Taito as well as a Sunsoft logo. That's because, unlike the original arcade release of Puzzle Bobble, which Taito developed and published, Sunsoft published this one--at the beginning of July in 1999. Sunsoft didn't develop it, though. A company called Yoshidayama Workshop handled that task. Don't worry if Yoshidayama Workshop doesn't ring a bell; before I started doing my research for this post, I'd never come across its name either. Which makes sense, as according to GameFAQs, Yoshidayama Workshop only ever developed a small handful of video games. Besides this portable Puzzle Bobble, it also produced two other WonderSwan titles (Meta Communication Therapy: Nee Kiite!, released in 2000, and Wonder Classic, released in 2001) and a Japan-only GameBoy cartridge called Itsudemo! Nyan to Wonderful. 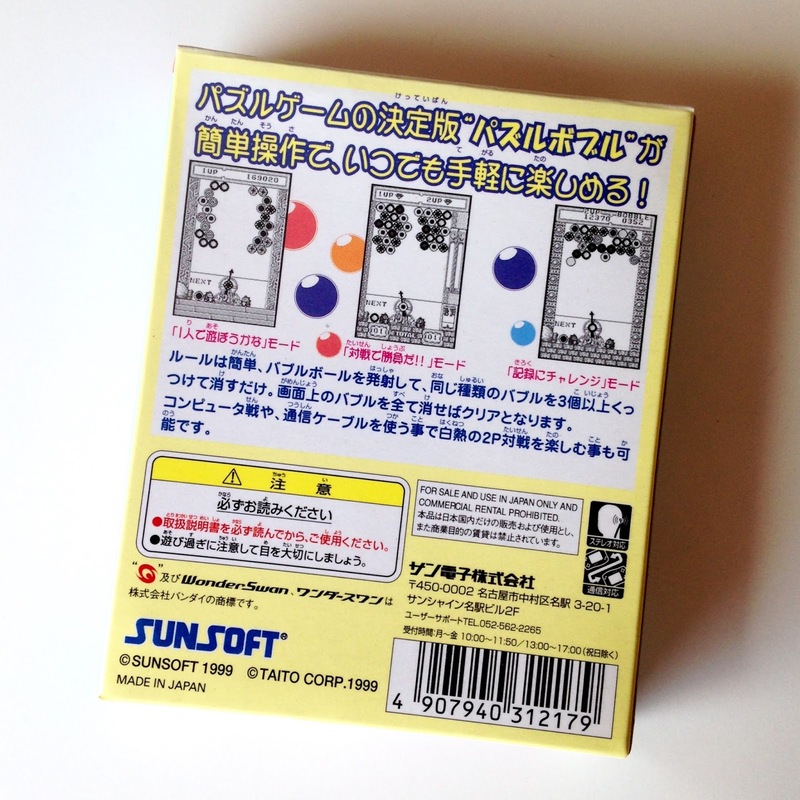 I can't speak to the quality of that trio of games, as I've never played any of them, but I can say Yoshidayama Workshop did a pretty good job down-porting Taito's Bubble Bobble-inspired puzzler to the WonderSwan hardware. I wish I could say the same about the designers who created this title's instruction booklet. Sure, it's colorful, as a glance at the photo above should make clear, but it's also devoid of the kinds of illustrations that pop up in every other Bubble Bobble or Puzzle Bobble manual I've seen to date. Oh, well, it's hardly the end of the world--especially when the rest of this Puzzle Bobble release's packaging is so stellar. What do you think of the box, cartridge and manual shots shown throughout this post? Also, what do you think of this version of Puzzle Bobble? Share your thoughts in the comments section below.